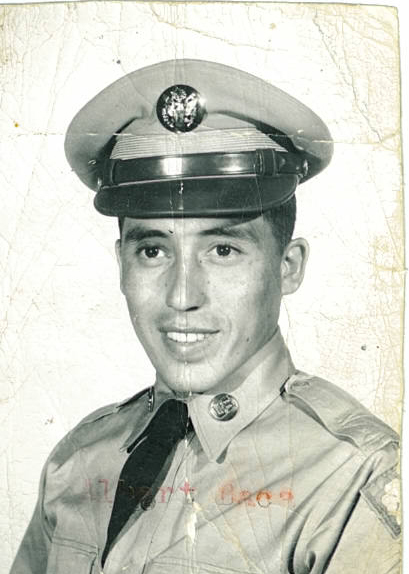 Alberto A. Baca, 86, a Silver City resident passed away Friday, April 6, 2018, at Memorial Medical Center in Las Cruces, NM. Visitation will begin at 9:00 AM on Thursday, April 12, 2018 at St. Vincent de Paul Catholic Church. The Holy Rosary will be recited at 9:30 AM by Deacon Bill Holguin. The Mass of Resurrection will be celebrated at 10:00 AM with Father Marcos Reyna officiating. The Rite of Committal and interment will follow at the Ft. Bayard National Cemetery. He was born on July 9, 1931 in Silver City, NM to Julio and Josefa (Arroyos) Baca. He proudly served in the United States Army in communications. Upon discharge from the Army he lived in El Paso, Texas. He became a barber and was co-owner of the Tigua Barbershop and Hair Styling. He returned to Silver City to help care for his mother and worked at CTS cleaners. He enjoyed reading, going to the movies, live theater, traveling, telling jokes, listening to all types of music and he loved dancing. He is survived by four sisters, Manuela “Nellie” Leyba, Mary (Julio) Chavez, Esperanza Silva & Josie Madrid, whom he resided with at the time of his death, all of Silver City. He is also survived by numerous nieces and nephews, his dear friend and dancing partner, Betty Quintanar and his senior companion, Ramon Gonzalez. He is preceded in death by his parents Julio and Josefa Baca, three brothers Julian Baca, Ben Baca and Thomas Baca and sister, Frances Orosco. Serving as Pallbearers will be Fred Baca, Richard Chavez, Joaquin Leyba, Ray Madrid, Manuel Orosco and Frank Silva. Honorary pallbearers will be his nieces and nephews.